Bid: No idea what the up/down arrows are for, or why the down arrow presents negative numbers. Someone please explain the use of this field. Offset: I chose a number from the dropdown to indicate how close to the auction end I want Gixen to fire my snipe bid--but if I were a new user, I would have no idea what "offset" means in this context. Offset Mirror: Since I am a paid subscriber, I chose a smaller number from the dropdown to indicate how close to the auction end I want Gixen Mirror to fire my snipe bid. Submit: Clicking submit popped-up a window asking me if I wanted the extension to remember my password. I chose OK (I don't recall that there was another option) and now "Settings Saved" appears in the "Settings" area. Seems to me someone should write a detailed User Guide for this extension. After installing the Gixen extension and reloading Waterfox, I could not locate the extension in my extensions list to see if there were any options or settings I needed to address. I finally discovered that the Gixen extension installs itself as "Autosnipe", so you need to tell people that OR change the name of the Add-on to Autosnipe. Consistency helps! A User Guide should tell new users to go to Autosnipe>Options>Settings before using Gixen (aka Autosnipe). Each of the "Settings" fields needs to be fully described, so a user will know what to enter in each one...and why! Then, a guide needs to explain how to use Autosnipe on eBay...followed by what error messages might appear...and how to deal with each of them. It also needs to explain when (and where) you will see an "Add to Gixen" field and button and when you will not. And, of course, explain that you need to put your Max Snipe bid in the "Add to Gixen" field. New Users don't know this stuff, and no user should have to guess on first-time use. UNTIL then...what are those up/down arrows for in the Settings "Bid" field...and why negative numbers? Thanks, in advance, for anyone's expert help. Can you elaborate on this a bit more, please ? 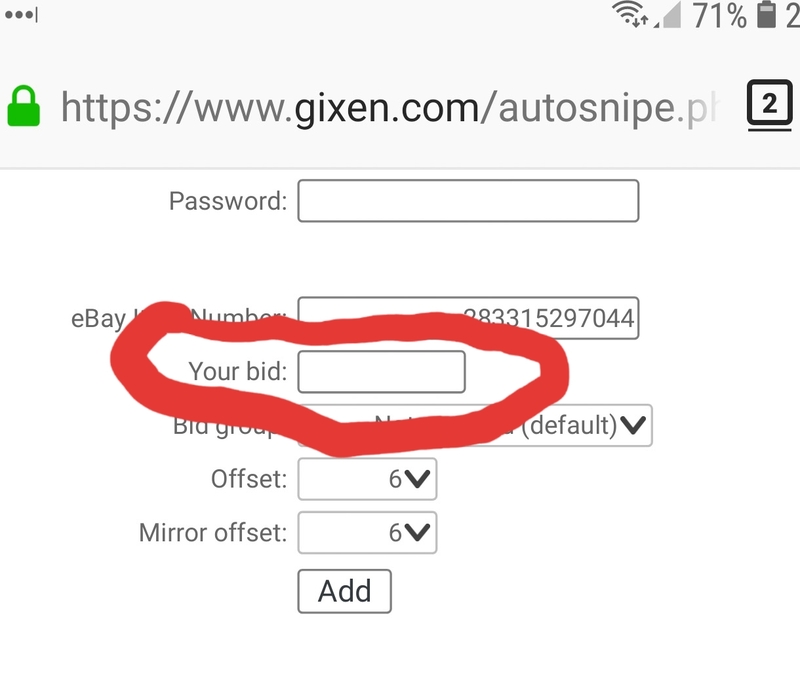 I think it is the default number that should go in the Max Bid field whenever you add a snipe using the Autosnipe extension.